The holidays are around the corner, we will connect in special ways with family and friends to share long-cherished traditions and participate in meaningful rituals. Whether your holiday traditions are quickly pulled together or long planned, complex affairs it's bound to be a memorable and joyful experience. In the upcoming week, I'll share with you a few tips of mine to add a flair of festivity to your home beyond just a beautiful tablecloth. A simple and easy way to decorate your table - Pretty Folded Napkins. There many ways to fold napkins, be creative! 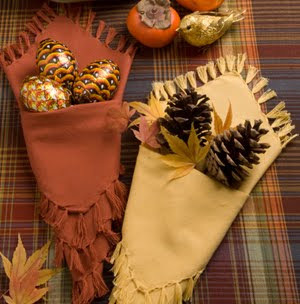 One of my favorite ways, is to make a small pocket out of the napkin which can hold an array of decorative items [such as pinecones, leaves, little notes, flowers or utensils]. Give this a try, and feel free to post a picture of your beautiful napkin arrangements. I always love to see your creations!